My conclusion: I can do it if I want to any I may from time to time but there is not time to do all I want to do as it is and this was not compelling enough for me to want to do it very regularly. And I think you are absolutely right about needing a non -creating break. I did do a lttle bit of sewing when I was away but I have given up for probably the next fortnight or so. The main creative activity right now is constantly redeisgning where the storage in my studio to be as the builder tells me that when he said, yes he could build what I originally designed, that he actually meant, oh, I didn't understand. no I can't build it like that because it has no support and will fall apart. The trouble is that he cares about the Building Inspector passing the joints and the walls and I care about how wide my cutting table can be and where my thread jars will fit! but decoration is due to start on Thursday and hopefully most furniture will follow fairly soon thereafter. And hopefully then my mind will be clear enough to create. And hopefully I will be able to find things to create with when they are no longer scattered in half unpacked boxes around the house! And hopefully when I am not crawling around the floor with a tape measure and an online furniture catalogue muttering "... 360 cm... less a bit... leave room for... squeeze in... 70 cm for the..." I might be able to blog deep thoughts about the Purpose of Creativity. But right now I am in Small Detail territory not Deep Thinking territory :) I enjoy that, the planning and the research and the narrowing down of possibilities. I don't mind when I have to change tack and adapt because of a construction detail and I think I am good at holding all the details in my head and noodling it all out. But it fills my head and takes my time. So I am going to surrender to it for the next couple of weeks and just get it done. My Mum said yesterday, "Maybe when you get your studio all finished and tidy you will have time to finish your novel!" I though everyone had forgotten about that and,when I have a desk dedicated to words not fabric, I would be able get it out and edit it in secret.. obviously not! Where the time for that will come from I don't know but I am sure a new desk will make it possible. You know how much faith I am placing in the power of a new writing desk! I am thinking of this one with some drawers placed nearby. I think I am craving the concept of a surface which is clear of everything but a laptop, lamp, fountain pen and beautiful noteook. Uncluttered and ready for thought! Of course, it will face a wall not a nice patio - hence why I needed the photo you kindly gave me of the grounds at Bishops ranch to remind me of retreat and how one day, when I am not paying for new windows and bannisters and toilets, I can buy a flight and come back. Not that I shall not be thinking about creativity whilst this work is on going though. I have book of essays on creativity I have just started which I hope will provide fodder for future correspondence and I hope to read, ooh, at least a paragraph a night in bed!! I is called Inspiring Creatvity: An Anthology of Powerful Insights and Practical Ideas to Guide you to Successful creating by Rick Benzel. I bet one of his ideas is: hire an Interior Designer. I did do two more fabric sketches when I was down in Bath, using some scraps I took with me. This one measures 15 x 8 inches. 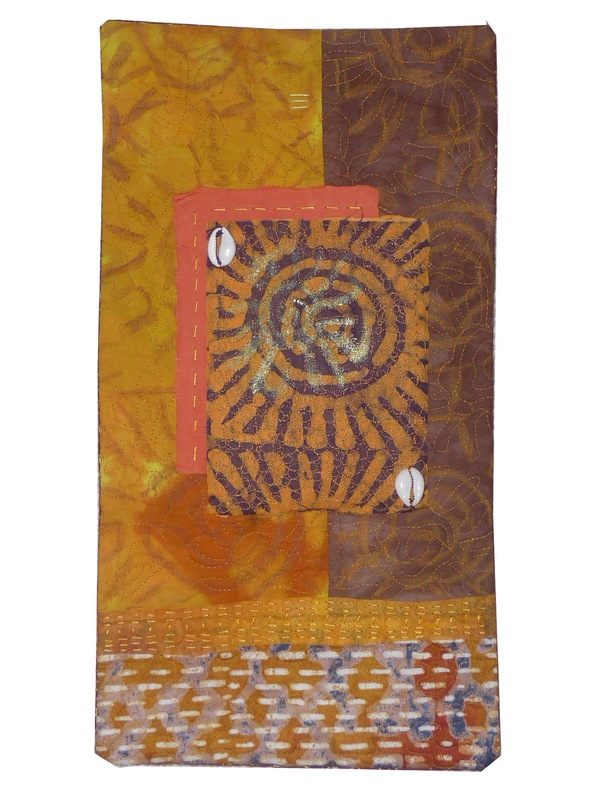 The bottom fabric is african batik but the top two background fabrics were plain handdyes. I used neocolour crayons to make marks inspired by the central fabric scrap then﻿ free motioned similar marks offset over the crayoning in an attempt to create some depth and interest. The plain terracotta is khadi paper. Ontop of the central scrap I made the same marks in treasure gold. I did not mean to make another African lady quilt. 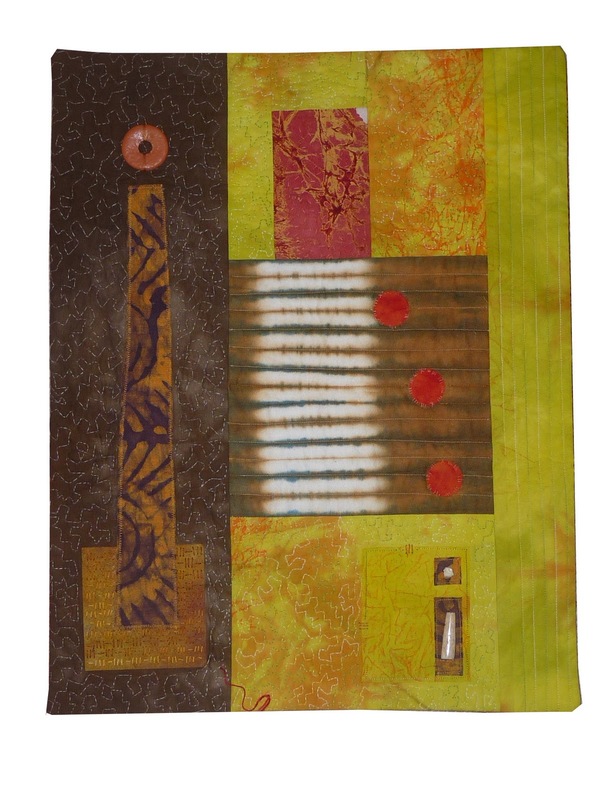 In fact I was inspired by the works of Hannes Hares who incorprated African textiles into his work. I was playing just with combining the central square bit with handdyes but somehow this rather totemic lady muscled in on the deal ﻿together with her bone baby in its grave. Such a happy set of quilts I seem to need to make recently! This one is 14 1/2 inches by 18 1/2 inches. Anyway, as I say, just sketches to flex my muscles. Comments welcome. Ok, I am going to go and have a bath and, while I am soaking make a mental list of what items I need to keep in the desk drawers and therefore what combination of which depth drawers I should order.... I think I will be a good thing that from the bath I will be able to see the design wall. All my best thoughts come when I am in water!